Species description: One of largest carnivore during dinosaurs age with 12” corner teeth with roots and up to 49 ft long and USA own species found in western USA. Very powerful and massively built dinosaur which hunted solitary . It easily downed its prey with quick surprise attacks. Description and rating:1-10 10 This is my third second section I received of TREX Organic Stomach Contents from same rancher at same place found years ago . It’s the only confirmed find in the world This is so valuable as one paper on this specimen from one animal has been found to date . IT comes with the paper describing this amazing part of TREX that is so unreal to imagine . You say why doesn’t bacertia break it down . Well just like copulate it is covered fast and a hard covering occurs fast and it gets covered and no bacteria of any type and get to it so it becomes rock mineral in many years . So many questions enter your mind on this but it comes from the rancher in the paper who has many jaws in his piece. It was covered quickly so bacteria could not work on it and it died just after a meal of course so thousands of things had to go right to obtain this massive great find. 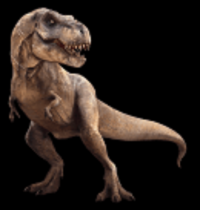 Research also shows the TREX died by drowning and it ate a small mammal just before death. You need to read this publication of CPSQ 2013 Article which comes with purchase .Since none exists for sale, and I kept one piece this is priceless. The rancher is a friend and sold only to me these pieces. I didn’t think I could get this piece but I bought it back to help a friend as I did own it before. This is the last piece ever for sale again This is not a large piece but its so valuable with bone pieces throughout .I’ve sold about 3 pieces earlier last year before conclusive paper was done so that piece is worth lots more now. It was a surface find so layering was so great even with on the surface. The details this is so great. The piece is absolutely outstanding and a must for a collector who wants everything found of a TREX .It is heavy and some bone material are seen throughout in all different directions. Certain spots due to elements created holes throughout which allows you to see the inner items. The value on this is so hard on this as it’s one of a kind again. The owner kept the largest piece and will never sell. It can be shipped safely. Talk about DNA-this is better and can be yours . Item location: Morocco, South Africa -South of Taouz, Morrocan Sahara. Item rating and description: 1-10 9.8 Large sized Deltadromaeosaurs Raptor teeth from N Africa called deltradromoaeosaurus.